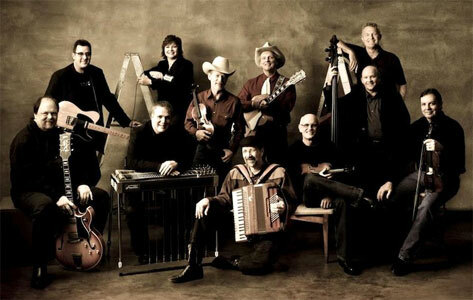 Groupe Western Swing US composé de chanteurs et musiciens de studio comprenant Robert Bowlin, Danny Parks, Dawn Sears, John Hughey, Johnny Cox, Hoot Hester, Joe Spivey, Kenny Malone, Carolyn Martin, Andy Reiss, Aubrey Haynie, Rick Vanaugh, Ranger Doug Green, Adie Grey, Michael Blaustone, Jeff Taylor, Kenny Sears et Dennis Crouch. Ils sont rejoint en 2012 par Vince Gill. A group of studio singers and musicians came together in Nashville in 1998 to form the Time Jumpers, a lively Western swing outfit. Initially, it was a loose gathering, consisting of a handful of members in a lineup that was subject to frequent change. The first lineup, which played for pure fun in a garage, featured Hoot Hester, Michael Blaustone, Dennis Crouch, and Danny Parks. The band's first time playing out featured Hester and Crouch, with the addition of Andy Reiss, Aubrey Haynie, Kenny Malone, Johnny Cox, and Robert Bowlin. They played out infrequently until they made their informal home at the Station Inn, where they began playing about twice a month. Informal sessions also occurred behind the scenes at the Grand Ole Opry, where the Time Jumpers would start dressing room jams while waiting to back other artists. When the group's Station Inn sessions increased to weekly, Rick Vanaugh stepped in to take Malone's place while Kenny Sears took over for Bowlin. In the meantime, Jeff Taylor also came aboard. Within months, Haynie opted to drop out. At one time, the group also featured Vocalsist Adie Grey. The band's album, On the Air, features Hester and Sears on Vocalss and fiddle, steel guitarist Cox, bassist Crouch, guitarist Reiss, Vocalsist and accordionist Taylor, and drummer Vanaugh. The band also includes singers Carolyn Martin and Dawn Sears, who is married to Kenny Sears. On the Air features an appearance by Eddie Stubbs, announcer for the Grand Ole Opry. Vince Gill joined the band in 2012, and is featured on the group's debut album, the self-titled The Time Jumpers, which appeared later that same year from Rounder Records. The album was a critical success, earning the group a Grammy nomination for Best Country Album in 2013. Just prior to the September 2016 release of their follow-up LP, Kid Sister, founding member Hoot Hester succumbed to cancer.